A romantic getaway is one of the most popular reasons for traveling. Even if you only have a short weekend available, you’ll find countless opportunities for romance in Atlanta or one of the intimate cities bordering this Southern metropolis. Find the excitement and mystery you’re craving with these activities. Ansley Park is one of the most gorgeous neighborhoods in Atlanta. Drive around to see the stunning architecture, and plan an evening walk around Piedmont Park. 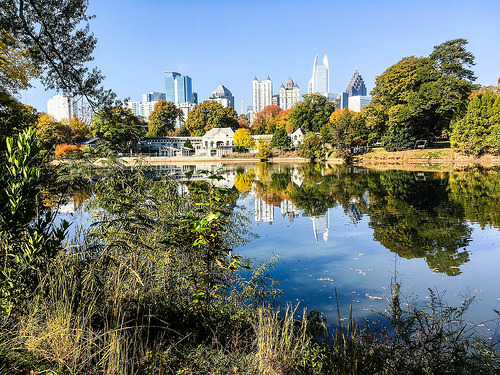 The centerpiece of the park is Lake Clara Meer, and you’ll be treated to moving views of the Atlanta skyline. Visit earlier in the day to take your date to the Atlanta Botanical Garden, which is open daily (except Mondays) from 9 a.m. to 5 p.m.
Once the sun sets, go to Loca Luna — a bar and restaurant bordering Piedmont Park. The eatery is known for its wonderful tapas, and you can dance the night away with the entertainment provided by a live Latin band or a DJ. Loca Luna is at 550-C Amsterdam Ave. NE and is open until 2:30 a.m. Fridays and Saturdays. Dressing up and attending an Atlanta symphony together is a wonderfully romantic experience. The formality of the occasion will have you feeling like you’re a celebrity, and live orchestras are known for being touching and emotional. Check the Atlantic Symphony Orchestra or Georgia Symphony Orchestra websites for upcoming events, and try to see the works of composers who were inspired by love. Atlantic Symphony Orchestra performs at 1280 Peachtree St. NE. Georgia Symphony Orchestra performs at the Marietta Performing Arts Center at 1171 Whitlock Ave.
Picnicking: Piedmont Park is one of the best places in Atlanta for picnicking. If you explore outside of the city, you’ll discover spots like Panola Mountain State Park to the southeast and Sweetwater Creek State Park to the west for an al fresco meal together. Wine tours and tastings: The country outside of Atlanta is excellent for growing grapes and producing wine. You can learn more about this culture at wineries such as Montaluce Winery & Restaurant in Dahlonega. This location, which opens daily at 11 a.m., is known for its romantic Tuscan atmosphere and inspiring views of the Chattahoochee National Forest. Hiking: Wake up early, cook breakfast together, and head off for some of the best hikes in and near Atlanta. Trails such as East Palisades along the Chattahoochee River and Arabia Mountain Summit provide stunning views, and you’ll be treated to some peace and quiet with just you and the object of your affection. You can also take the opposite approach and stay outside Metro Atlanta but venture into the city to enjoy the romantic things to do. Indeed, it’s often more convenient and affordable to stay outside of the urban center. Book a room in Norcross or another city on the outskirts of Atlanta, and look forward to peace and quiet while saving more of your money for Georgia romance.